Summer is the perfect time to read! 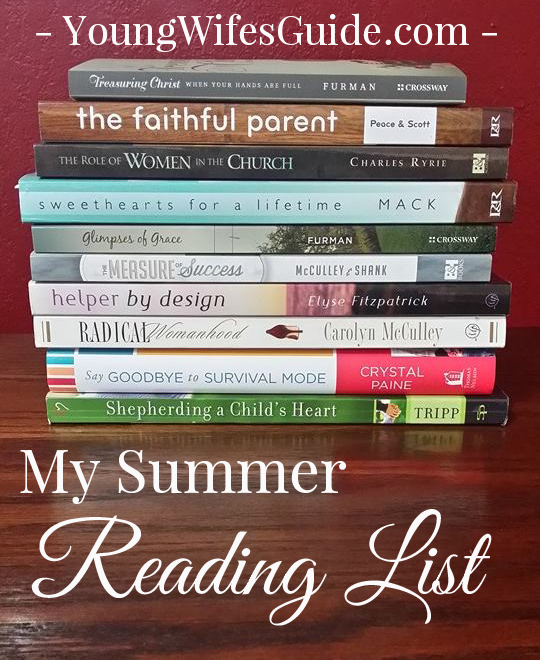 I want to take advantage of long summer days, less commitments, my kids occupied with playing outside, and read more this summer. I always get excited when I head into a bookstore or browse through Amazon. There is something so exciting about picking out a new book, reading through the table of contents and diving in. New worlds to explore. Knowledge to acquire. Tightly held beliefs to be shattered and replaced with Biblical convictions. And all glory to God in the process. Sometimes, I’m absolutely terrible at reading. I’ll go months without picking up a new book or challenging myself. Why is this such a bad thing? To go months between reading books? I mean, after all, I’m a busy work-at-home-mom of twin toddlers, wife to Jason, and keeper of our home. So what if I don’t have time to read!? The importance of reading is that it is a crucial step in our sanctification. It’s a powerful tool by which the Holy Spirit helps to grow us in our Christian walk. Reading solid, Gospel-Centered books (along with daily Bible reading) on Christian living, marriage, parenting, and more is a vital ingredient in the Christian’s life. I know that life as a busy woman can leave little time for reading. I know that when you finally crawl into your warm bed at night, the last thing your eyes (or mind) can take is reading a book. I know that you already feel so busy, that you don’t think you could possibly add another activity to your schedule. I know, because that’s MY life! But exhausted Mama/wife/woman…reading can refresh you, encourage your soul, and challenge you to become a better wife, mom, woman, homemaker, and follower of Christ! Through reading, you can challenge yourself to daily die to self and put on Christ. It’s hard, but daily saturating your mind with Gospel-Centered truth can give you a peace throughout your day and help you to manage those hard moments. A note to young moms: If you just feel completely overwhelmed, know that you are not alone! I had a mom of 4 kids under 5 years old message me saying that she is really struggling to find any more time than a few minutes each day reading her Bible. My Response? Dear sweet Mama, I don’t have 4 kids under 5. I have two little ones right now and I can manage to sneak some reading in while they watch Sesame Street in the morning. I get up early and do some reading in the quiet mornings. I read at night when my kids go to bed. But when my twins were first born, it took me six months to read one book! Give yourself some grace, being a mom of little ones is hard work! And they won’t be little forever. Cherish these moments, sneak in some reading time when you can, and don’t stress if you can’t read 6 books in a summer. Give yourself grace and remember to pray during those hard, busy days! “In this encouraging book for frazzled moms, Gloria Furman helps us reorient our vision of motherhood around what the Bible teaches.” Wow. This is a book that I need to read! I am that frazzled mom! As busy moms, we daily juggle so many things. We run from activity to activity and can barely catch our breathe let alone treasure this thing called Motherhood. Why I picked this book up: This book is short and looks like a quick read. It’s perfect for the busy, stressed out mom who needs some Gospel-Centered encouragement! I’ve not read anything by this author yet, but this book comes to me highly recommended! Find it here in Print & on Kindle. Carolyn MaCulley is the author of one of my very favorite books (and one that I’m re-reading this summer) called Radical Womanhood. She approaches the role of women but a thoroughly Biblical standpoint and I appreciate her commitment to the Gospel. Her new book tackles tough subjects such as should a woman work? Can a woman be feminine, godly, and ambitious? Why I picked up this book: As a work-at-home-wife who runs and manages a blog and is working on a book, I have been wrestling with these questions myself. My ultimate priority is as a homemaker, but can I glorify God by using nap time to write also? Find it here in Print & on Kindle. My husband got this book for me at a conference he went to a few months ago and it’s been sitting on my shelf just waiting. The role of women within the church, can women be pastors, where can we serve and teach, are all big questions within the Christian world today. The tagline of this book is “Treasuring the Gospel In Your Home”. Done. I don’t need any further convincing to read this book! As a homemaker, a large portion of my day is consumed with dirty diapers, mountains of laundry, doing dishes yet again, and a hundred other mundane chores. But what’s the point of it all? Does God really care how I run and manage my home? Why I picked this book up: This book is another one that came highly recommended to me, and it looks so encouraging! As women, I think we could all use a little dose of perspective into how our lives as homemakers really do matter! Find it here in Print & Kindle. Elyse Fitzpatrick is one of my all time favorite authors. If you’ve not read anything by her, then I highly recommend you change that immediately. 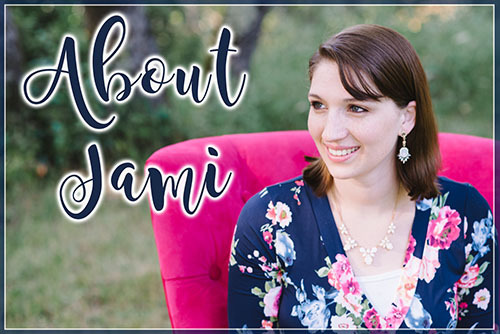 She is so honest and transparent about the struggles that we face as women, and how we need to treat those struggles in the light of the Gospel. 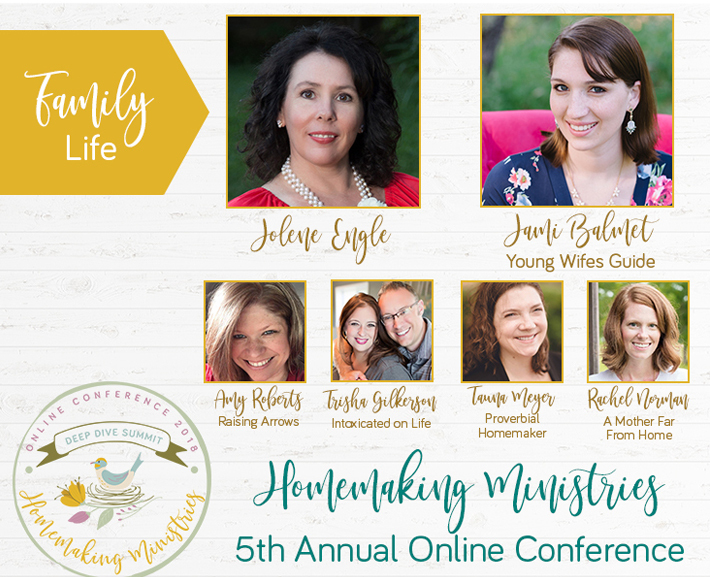 Learning how to submit and be a godly helper to our husbands, is perhaps one of the greatest struggles we face as women. In this book, Elyse dives into Scripture and takes an in depth look at how we can view our roles within marriage. Why I picked this book up: I’ve read books on my role as a woman in the past, but the funny thing about time is, I tend to forget those lessons as the days and years go by. Being a submissive wife is not something that comes naturally to me (obviously) but it is something I desperately want to work on! Find it in Print & on Kindle. The author is a former Feminist turned Christian in her 30’s. In this amazing book, she dives into Feminist history to give a thorough account of how feminism has largely shaped our view of women in the church today and how instead, we need to recapture the view of our roles as women from Scripture! Why I picked up this book: I read through this book several years ago and I’m ready for a fresh read through. I picked it up last week so see if I could find a good quote for something I was writing, and I realized how much I had forgotten about this book and so I decided it was time to read again!Find it in Print & on Kindle. I began reading Say Goodbye to Survival Mode this Spring and decided that it was something that I needed to blog through. There are 9 challenges in the book that will help you go from stressed out and in survival mode to feeling in control of your life! Throughout the book, Crystal helps you to develop a personal priorities list, create a routine, form habits, and more. Why I picked up this book: I have heard some amazing things about this book so I decided to give it a try. And it’s true, this book has literally transformed how I approach my day as a homemaker and how I evaluate new commitments and priorities in my life. I highly recommend you check out this book or join in the book study that starts next week. We will walk through each challenge together and learn how to say goodbye to survival mode! Find it in Print & on Kindle. It’s very important to my husband and I that we read Gospel-Centered books together. We alternate between reading books on marriage, parenting, and general Christian living. We usually read a chapter together at night when we get into bed. One of us reads it out loud and then we spend a few minutes discussing it. It does’t take long, but it’s become a precious habit to both of us. Why I picked up this book: As our twin boys are still young (17 months), we want to make sure that we are laying the ground work now for parenting that is firmly rooted in the Gospel! This book gives great wisdom from Scripture and also practical advice on how to parent! Find it in Print & on Kindle. We started this book a year or so ago and just never got around to finishing it. So this summer, we decided we needed to get it finished! Growing up kids in the Lord is so much more than behavior modification. It’s about daily teaching their hearts. Why I picked up this book: This book has become a classic when it comes to Biblical parenting. I’ve heard so many amazing things about it, I can’t wait to get into it! Plus it’s only $1.99 on Kindle right now!! Find it in Print & on Kindle. This is the book we are currently reading and it’s been amazing so far!! It’s a hefty book but it’s broken down into small easy chapters that pack a powerful punch! Each chapter has a powerful message mixed with real life stories and convicting passages of Scripture. Then each chapter sends with a section of questions to go through together. It’s a great book to go through together as a couple. Why I picked up this book: As the years go on and we are no longer newlyweds, the sweetheart part of our marriage is easy to lose. We both want to make sure that we are cultivating our friendship in marriage and that we are standing firmly on Christ and the Gospel! Find it in Print & on Kindle. This looks like an excellent list – thanks for sharing! I’m a young mom to 3 under the age of 2 (which means a set of twins!!!). I’m very busy, but agree that reading is important and I always feel refreshed when I take in a few pages of a good book. Not to mention, it’s actually a very devotional experience and God often weaves the truths from the book into the same things he is teaching me through scripture. I’m definitely adding some of these to my reading list!! Wow Emily! I know part of your pain 😉 I have twin 17 month old boys! Reading is SO refreshing to me also. And I need to challenge myself to stay in God’s Word and reading through good books because otherwise I’ll use those few minutes here or there on dumb things (like browsing through Facebook or watching tv lol)! Thanks for the great reading list, Jami. I’m very interested in checking out “Helper by Design.” My Bible study is focusing on God’s role for us as wives, so we’ve been doing a study, and I’ve been doing some reading on books with that subject, as well. I just finished reading a brand new book you might be interested in adding to your reading list. It’s about effectively influencing our marriages in a positive way by changing what we can – ourselves – our attitudes, actions, decision, priorities and words; honoring, nourishing, communicating, etc. It’s called “The Wholehearted Wife: 10 Keys to a More Loving Relationship,” by Erin, Greg and Gary Smalley. Biblical, inspirational, affirming. One of my favorite quotes is, “When we turn to God for help, he fills us with his love and enables us to see ourselves and our husbands through his eyes. Keep in mind that a wholehearted wife focuses first on her own heart!” I highly recommend it! Great list Jami. Shepherding A Child’s Heart is one that I read through every so often. I follow it with Instructing A Child’s Heart. This is actually one that I LIMIT myself to reading only one chapter a day. These are packed with such biblical goodness that I want to digest them slowly. I spend about a month on each one with thoughtful prayer before and after my reading. “Speak to me LORD through his message.” They are two of my favorite. Good list here. Interesting, thanks for the inspiration! Some gospel-centered parenting books you might enjoy: “Loving Our Kids On Purpose” by Danny Silk and “Jesus the Gentle Parent” by LR Knost. Blessings! Also “Grace Based Parenting: Set Your Family Free” by Dr Tim Kimmel.